The backdrop to today’s game had been challenging this week – for fans, players and the manager. Despite all the confidence that was coming from the club that things could be turned, the reality of the situation was that if Bolton won and the game between Fulham and West Brom was a draw the Arsenal would be bottom of the league. Unfathomable considering the next league fixture would be away to the Spuds. This meant that the first XI and Arsene needed to walking the walk rather than talking the talk in order to resurrect an appalling start to this season. A start to the season that was compounded even further by the news prior to kick-off that Jack Wilshere was going to need surgery on his ankle and would be out until Christmas! For all you good boys and girls out there, if you’re writing a Christmas list make sure that the big man at the North Pole hears our cries loud and clear from North London that we need Jack back and quickly. It was going to be interesting to see how the defence would handle the burly exploits of a Bolton team that stills retains a reputation of being slightly more physical than the aspirational football that some people give Owen Coyle credit for. To be honest the first half was not the finest game of football we shall see at the Emirates and Bolton were keen emulate that last game against the Gunners and try and nick a win. 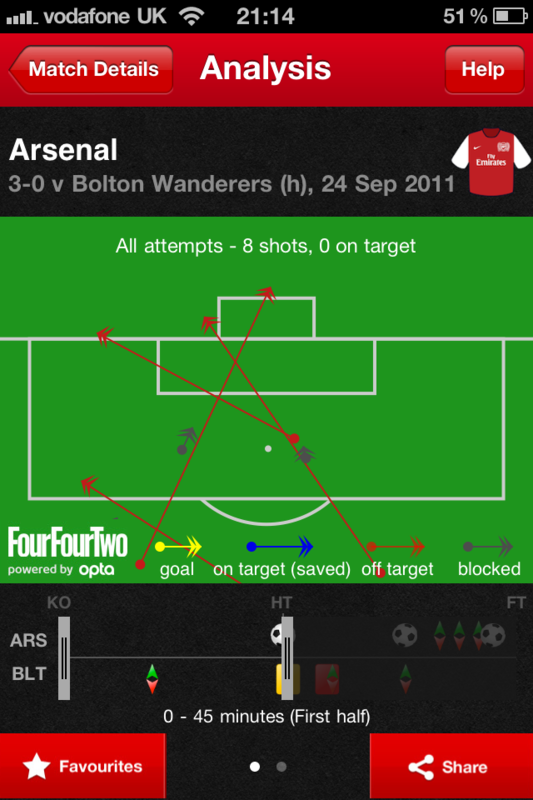 The Arsenal back four looked nervy and unsure of what to with the ball and this gave Bolton the impetus. Within a couple of minutes from the kick-off the first chance of the game presented itself to Darren Pratley who managed to get ahead of Kieran Gibbs from a crossed header and prodded the ball towards goal. A chance very similar to one made by Swansea in the last league game at the Emirates and once again Szczesny was on par to the effort and he made another magnificent save to prevent any early embarrassments. After this Bolton had a couple more chances from wide and each time the Bolton attack seemed to be better positioned that the zonal marking system adopted by Arsenal. At this time, everyone’s favourite Bolton player, Kevin Davis, was warming up on the touchline. A surprising move but it wasn’t long before he replaced N’Gog following a head injury and the Arsenal crowd gave him a “warm welcome” that a player of his tackling capabilities deserved. The rest of the first half was quite a dull affair with the only chance of note was a retaken free-kick where Arteta played the ball short to RvP who had enough space to curl the ball just wide of Jaaskelainen’s far post. A yard further back and that would have been 1-0 to Arsenal. The main concern going into the half-time break was how were the Arsenal defence going to be able to shore things up at the back. They had been carved open too frequently for comfort and whilst no clear cut opportunities were created by Bolton you still did not want to give them the chance to be more dangerous. 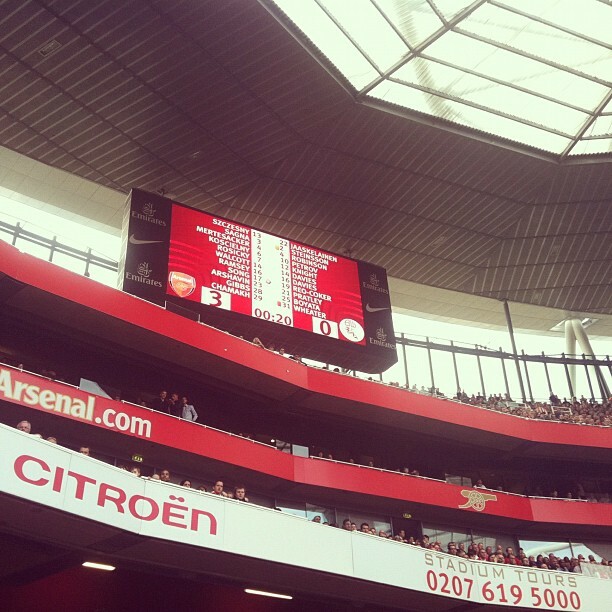 Just before the break the game livened up during 2 minutes of injury time both of which were created by Walcott. The second of which was better which a shot from the edge of the box going over the far corner of the goal. I’m not sure if this final couple of minutes gave the team a little more self-belief or that Arsene’s half-time talk changed the approach of some players but something changed over that 15 minute break and we saw a different Arsenal side in the second half. Who was it that said that a football is a game of two halves? Today we saw two different sides between the first and second half and not a substitution in sight to claim the glory. Rather than the first half when the defence appeared to be devoid of ideas and were unable to get the ball through midfield with much penetration, the start second half saw both Mertesacker and Koscielny taking the ball and moving towards the Bolton midfield. A nice change from the sideways passing we’d seen so far. What this did was to draw the Bolton midfield towards the ball and open up space between them and their defence and the dynamic changed in an instant. Arsenal could attack the defence without having a to go through their midfield at the same time. And within a couple of minutes, bang! 1-0 to the Arsenal. For once, Mark Clattenberg made a good decision in allowing play to go on after Gervinho was clearly fouled and RvP scored a goal reminiscent of the one at home against Barcelona last season by beating Jaaskelainen at his near post. The space was small and the keeper could be blamed for bad positioning but these are split second decisions and our captain took his chance to score his 99th goal for Arsenal. For 5 minutes after the restart Arsenal suddenly woke up and the interplay between Gervinho and RvP was delightful and further chances were created with the Bolton goal starting to take a peppering of shots. After 55 minutes it was time to say cheerio to David Wheater who was sent off for a professional foul on Walcott. RvP play a through ball to Theo who was starting to find his gear when he was pulled back by the Bolton defender. It looked somewhat harsh from where we were sat but the rules are the rules and he committed a foul as the last defender – even though the goal scoring opportunity may not have quite presented itself at the time. Nethertheless, for the second year running, Bolton lost one of their central defenders to a sending off and it was only proper for the fans to wish David their best as he went for an early bath. Cheerio, cheerio, cheerio! Cheerio, cheerio, cheeriooooo! Whilst it was unlikely that the sending off would have had a great impact on the new found enthusiasm for Arsenal to attack the Bolton goal there were plenty of chance created. 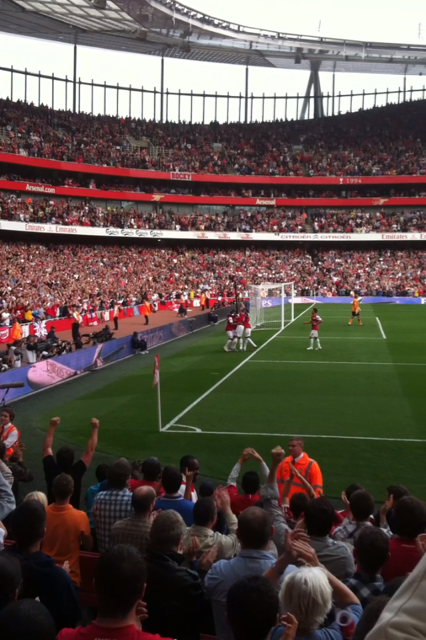 Arteta had a couple of opportunity, RvP had a header wide and even Koscielny had a chance from outside the box. Bolton did create one chance of their own following another one of those controversial play-ons whilst a player was down injured. 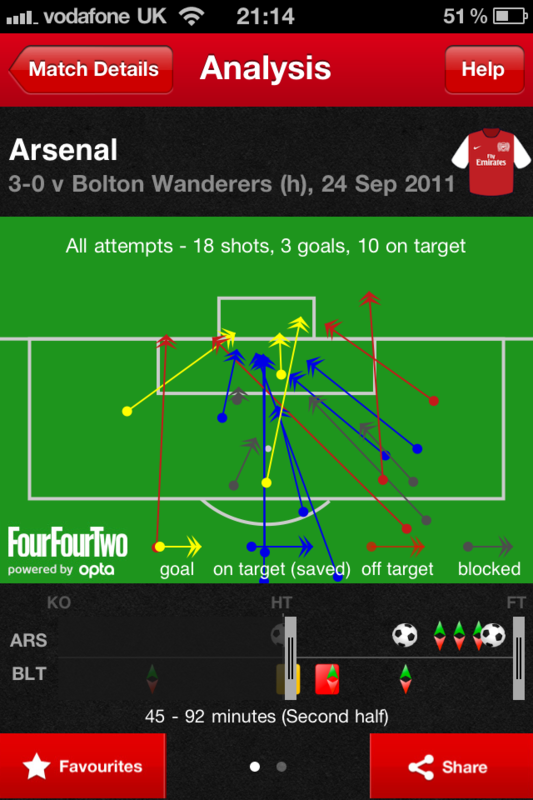 With a Bolton defender down in their own box, Arsenal continued to play on and try to create a chance. Jaaskaelainen was obviously try to get people to put the ball out of play when all of a sudden Bolton had a break and Chris Eagles was one on one with Szczesny. Eagles could have done much better given the opportunity but the young Pole made the save and ultimately the ball went out of play. Words were exchanged between the Bolton goalie and RvP to the point when Robin appeared to want to take on the entire Bolton defence in order to tell Jaaskelainen to shut up. Would Jaaskelainen have been moaning if Bolton had gone onto score – of course not but those are the rules and both teams have to play to them so not sure what the problem was really. If a players seriously injured then the referee would have stopped play but that is why the rule came into force to avoid people going down too easily and stopping play. A great milestone for him to achieve joining the 100 goal club which has a membership of only 17 players. Having become captain, RvP seem to have taken the responsibility in his stride and whilst he can be an inspiration of the pitch to his fellow players the class of the individual shone through when he paid his respects to the fans whilst the announcement from the tannoy was about him reaching his own personal achievement. With 4 minutes left Robin came off to a standing ovation to be replaced by Chamakh yet there was still time for another goal. In the final minute of normal time a pull-back from Sagna back to the edge of the penalty box found Alex Song in a clear shooting position. However, he still had a little bit of work to do and took the ball from his left foot just wide of the advancing defender to crack a right-footed drive into the top corner. 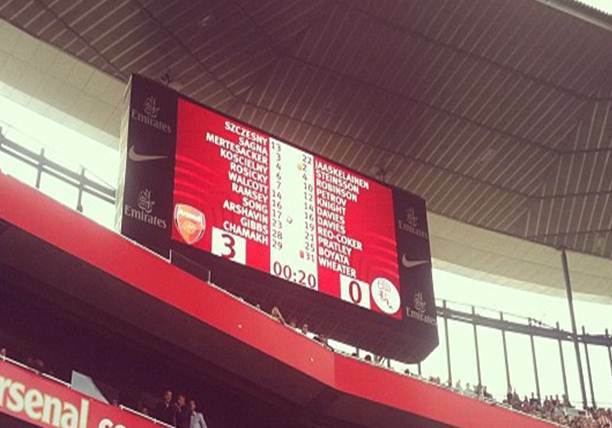 3-0 to the Arsenal and that felt much better. The game finished and the slight dampener on events was that Theo Walcott came over in injury time (Theo, injury time is not supposed to be the time you get injured it’s just a little bit extra that the referee adds on, normally for no good reason) and we are yet to hear what the injury actually is. At the moment there are mixed reports as to whether it’s good or bad and we can only wait and find out in the next day or two after the obligatory scans has been performed. It’s certainly great to have another home win under the belts and this one being a little more convincing. Made all the more important when you glance at the other results of the afternoon and all of the other top 4 hopefuls were in winning positions two. Arsenal now find themselves at the heady heights of 12th in the league and Bolton drop down to bottom of the table. As I alluded to earlier, this really was a game of two halves and there was no obvious reason as to why the Arsenal team came out for the second half so much more energised. Maybe the power of a good team talk made the difference…..? If you look at the shooting stats you can see that the possession that Arsenal had today was being created into chances and even though the goal/chance ratio is still quite low at least all of the goals were registered on the Arsenal side of the scoreboard. Next up is the Champions’ League group game against Olympiacos and as Wenger has admitted after the Dortmund games, mistakes may have been made in the past by not seeing the group stages through to topping the groups so I would anticipate that he will be pushing hard for a win of Wednesday. After this is off to Sh*te Hart Lane next Sunday (obviously due to Thursday Spursday) and the next real test to this team to put in a good performance and show the league that the Arsenal are back and mean business. And if there’s anywhere you want to have mean business then it’s against the Spuds that you want to be meanest. On a final note, I’ve had great feedback on new items and features for the blog and will be considering all suggestions here that you have regarding what you would like to see from this blog. 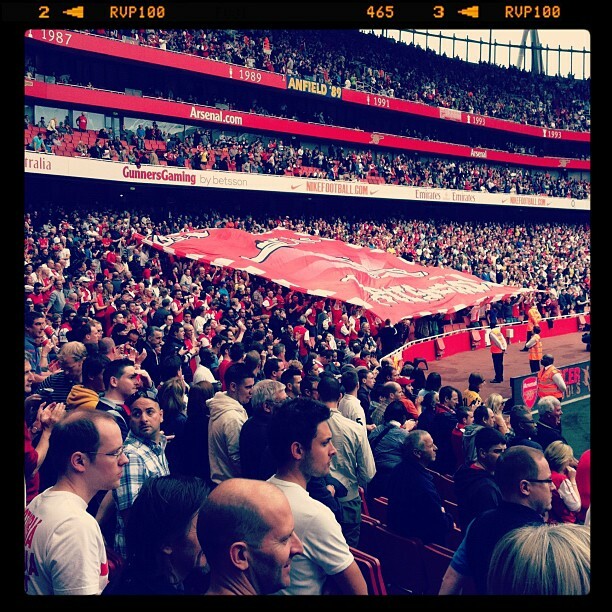 Until Wednesday, come on you Gunners!!!! !